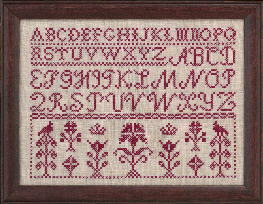 Home > Alphabet > Pennsylvania Sampler 9" x 12"
This cross stitch stamped sampler craft kit is a reminder of the traditional teaching sampler, alphabet and Quaker motif. Early in their academy studies, young girls were taught their stitches and alphabets and this cross stitch printed sampler craft kit gives a sewer another chance to capture this style. Recently finished this, and it is just beautiful! Linen fabric is high quality, and stamping quite easy to see. I am ordering the custom frame for it. Will be a lovely addition to our home.